This family-owned and operated winery is located a few miles north of Selah, Washington. A small estate vineyard grows a bit of riesling, while other grapes are sourced from the Lawrence vineyard (on the Royal Slope) and select locations in the Yakima valley. Scott Southard wrote me a bit of his history when he was first starting the winery. “I graduated from the University of Washington in 2003 with a BA in drama,” he explained, “but I couldn’t bring myself to move down to L.A. and start auditioning for commercials and bad television pilots. [Good call!] Eventually I decided that I wanted to work in the wine industry and so I apprenticed at Kana and Yakima Cellars in 2005 and was hired as an assistant winemaker by Coyote Canyon (who had purchased Yakima Cellars) in 2006. I have tasted three or four vintages of Scott’s wines and quite honestly they were outstanding from the very beginning. Noteworthy for their elegance, finesse, balance and depth, they have gone from strength to strength. As far as I know, they remain completely under the radar of other wine critics (even my hard-working friend Sean Sullivan seems to have missed them). 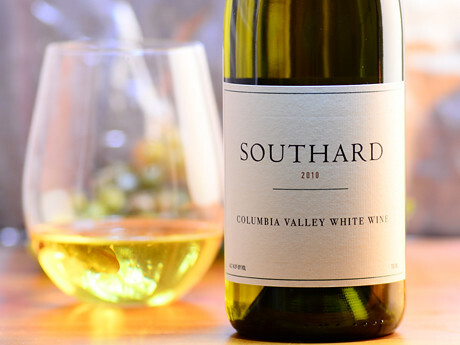 Quite honestly, Southard is the winery of the year as far as I am concerned when you factor in quality, price, and the extra bounce that the thrill of discovery offers. Here’s a look at upcoming releases. Two thirds Viognier, one third Roussanne, this humbly-labeled white is a revelation. In the mouth it has the style and sleekness of fine Burgundy, with flavors running through a spectrum of herb, citrus and tree fruits. Polished and seductive. Put this into a blind flight of French rosé and it will seem like one of the crowd. Crafted from 65% Grenache, 29% Syrah and 6% Cabernet Sauvignon, it’s a gorgeous onion skin shade, bone dry, dusty and detailed. The elegance and length are exceptional. This is the best Washington rosé I’ve had this year. Though labeled simply Red, this is 90% Grenache and 10% Syrah, from a single vineyard. The fruit is very tart, rather light, with pretty cherry highlights. Tannins are firm and hint at stem flavors. This bone dry, southern Rhône-style red blend consists of 61% Grenache, 18% Mourvèdre, 12% Cinsault and 9% Counoise. Elegant and detailed flavors of light berry and Bing cherry are dusted with cocoa accents. The star of the show. You can pay four times as much for comparable Royal Slope projects, or grab this jewel. Dark and bloody, this fascinating Syrah masterfully mixes layer upon layer of detail. Red meat, black olive, cassis and earth roll across the tongue, while hints of floral scents and chocolate linger in the nose. The website lists back vintages of different wines for sale. Reviews of those wines may be found online here. The Southard website lists retail locations to find their wines. The winery is open Saturdays and Sundays, noon to 5, and by appointment. Great article! Its great to see Scott get the press he deserves for his awesome wines. Thanks for posting. I can say I've heard of them but can't say that I've tried the wines. Look forward to checking them out! I don't drink wine, beer, spirits as a general way of life. Wine, in particular, always gave me headaches. I always assumed it was because there were some unnatural chemicals or additives. I once experienced what the Real Thing was in 1970 when visiting Spain. Our gracious host busted out a dusty old bottle of some kind of red wine that must have been worth several hundred dollars at that time. It was virtually a spiritual experience! I know that if wine like that was readily available I would probably say yes to it often. In the last decade I've had occasion to sample some of Southard's wines and did NOT get headaches from it -- a crude standard of measure, but the only one I can go by. I knew right away there was something different about their process, that they were going extra miles to make their wine special. I have met the Southards, toured their facility and concluded there were "Holy Works" going on there, above and beyond the norm. I believe they operate on a much higher set of standards. That is all I have to say! I've known the Southards since the 90s when I used to walk my dog by their property in Selah. After they planted their vineyard and I was working at the Yakima Valley Business Journal, I wrote a two-part story on their new endeavor. The past three years we've had fun helping them with harvest and at least once with bottling. Not only does Scott make great wine, but they are fine people. Visit them at their winery if you can. So pleased to see some great comments for our cousins, the Southards. Scott is a very talented winemaker, and we're pleased that he sources grapes from our vineyard. He's a fantastic partner in the grape growing process. If you haven't tried Southard wines, track them down asap. You'll be pleased you did! I visited in April. Liked it before, and more after the visit. Bought the syrah. Thanks for the article. I've tried Southard a few times, Whipping Boy Cab is a treasure and great value and the new GSM from Sugarloaf was my favorite at Taste Washington. At $20 it's a case worthy wine. Thanks for giving them a nice write up Paul! We had the pleasure of stopping by Southard this past April. I encourage others to do so. We had always wanted to stop at several locations in Selah, but they were difficult to find. This time, using GPS, we went right to Southard; we were disappointed to find they were closed, but Scott saw us walking back to the vehicle and invited us in. Scott answered all our questions and was a gracious host as we tasted their wines for well over a half hour. It was a great experience, being treated like a guest in his tasting room. We'll always be fans of Southard and look forward to many visits in the future. Paul, thanks for sending us on our first visit to Southard in three years. Scott clearly has grown as a winemaker in that time. We were very impressed with the Euro-style finesse and restraint in the wines. Doug, Scott's father, did a terrific tasting for us of just about the whole line of wines, including the latest Riesling, which you didn't review, and the Mourvedre/Syrah blend, which we loved. Terrific quality and value. A real pleasure.